Posted 9:01 am by Rena Anya Devéza & filed under Alexander Technique, Alexander Technique Teacher Training. Life becomes, at times, très mouventée. Very turbulent. This happened in my life recently. At the end of this hyper-busy period I realized that a psychic shift had occurred within me…perhaps due to the confluence of the particular stuff that had transpired. All good…but…it so happened that I had no time at all to write on this blog. Now…back to Alexander Technique teacher training: in the “hands on” part of the class, I am still moving (mostly) my trainer, forward and back while he is sitting in a chair, and then following him while he gets up from the chair. While doing this, an interesting thing occurred that helped me along in the more reliable sensory appreciation department. I had been going about moving him very seriously, concentrating hard, no doubt furrowing my brow, and I was gripping, gripping, especially in my arms. And then one time he made a funny comment and I smiled, and he said “you smiled and you accomplished un-doing!” So then I smiled some more and I was delighted. Smiling brings about un-doing! When I smile and laugh it is easier for me to move my hands “from my feet” and to un-grip somewhat those flexor muscles. Even if these moments of good use are fleeting right now…I’m so happy about my progress! And well, it does make me giggle to realize that, indeed, I can move about a dude who is a foot taller than me and who weighs almost twice what I weigh. And I can do this with ease if I am set up well. He becomes light as a feather. Hilarious. Is this kind of a naïve statement from a still neophyte trainee? Well, I don’t care. It all delights me! The other day, while going down to work on the subway, I noticed a man sitting across from me who had eyes that really smiled…they smiled broadly in fact. Looking at him, this total stranger, brought joy to me. And I thought to myself that I will try my hardest to emulate this man! Posted 1:50 pm by Rena Anya Devéza & filed under Alexander Technique, Alexander Technique Teacher Training. 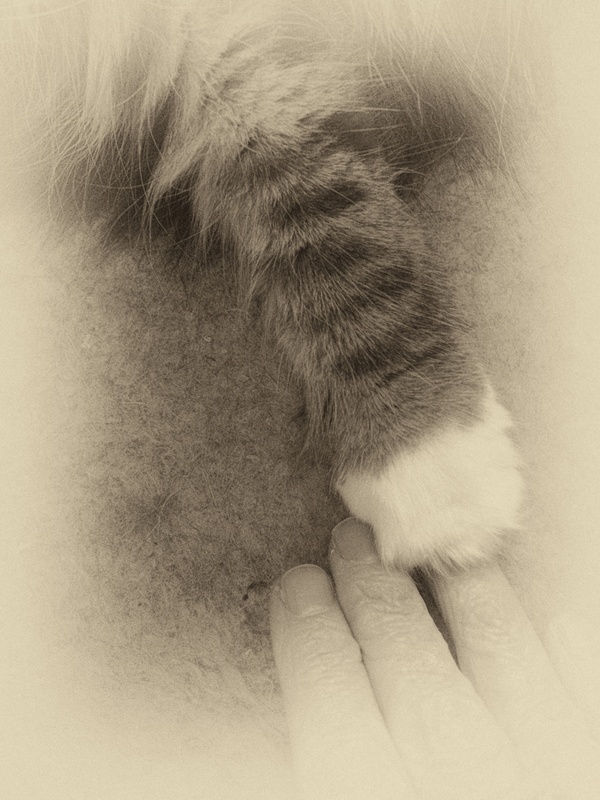 As I was going about my morning the other day…feeding Doucette the cat, making my coffee, etcetera…I realized that I felt more lengthening and widening of my back going on. I felt more “up” than my norm, more elastic in my thoracic spine, and very calm. Clearly, I had achieved a step up in my sensory awareness. Clearly, this is a cumulative process, and I am wondering if my latest work in my Alexander Technique teacher training has given me a gentle little push in this direction. I have been putting hands on others, first following them, now guiding them back and forth in a chair. It is all about my own use of self. I used to laugh with my trainer while telling him that he was hard to move. He said to me that he refuses to move if I am not set up and/or “I don’t have him”– in other words, if I am using my hands with poor use of self…if I am pulling him down because I am not lengthening and widening, if I am gripping with the flexor muscles in my arms, if I am not connecting my hands to my feet… And then all of a sudden he became easy to move because I was moving him with better use of myself. I was going up! I was widening! I was more successful at not gripping in my arms… I thought he was moving himself forward and back in the chair and jiving me but he wasn’t. He told me that I found it easy to move him because of my better use of myself. Here is a great analogy, from Walter Carrington, as he discusses the issue of how a teacher’s hands should be. Teachers have to be “…going up themselves–they’ve got to have the freedom, co-ordination and flow of energy that is necessary to lengthen in stature. I’ve often said to students that it’s a similar situation to when you’re on an escalator on the underground. You put your hand on the handrail and you know immediately whether the escalator is traveling at the same speed as the handrail. Similarly, the more the teacher is reliably going up, the more readily they can feel what’s going on in the pupil. Then if you discern some fixity or rigidity in the pupil–there’s stiffness somewhere–you’re going to see whether with your hands you can give a stimulus to release it.” Personally Speaking, p. 114. Later this evening, while in class, I must remember this analogy! Too bad I won’t be using a subway escalator on the way over to Alexander Technique teacher training today! Here is what happened when I was trying to take a photo of my hands for this post. Doucette got into the act! Posted 8:26 pm by Rena Anya Devéza & filed under Uncategorized. Welcome to the new website of Ms. Rena Anya Deveza, Alexander Technique teacher-trainee in New York City. Posted 12:45 pm by Rena Anya Devéza & filed under Alexander Technique, Alexander Technique Teacher Training. Spring is sort of showing up here in NYC. 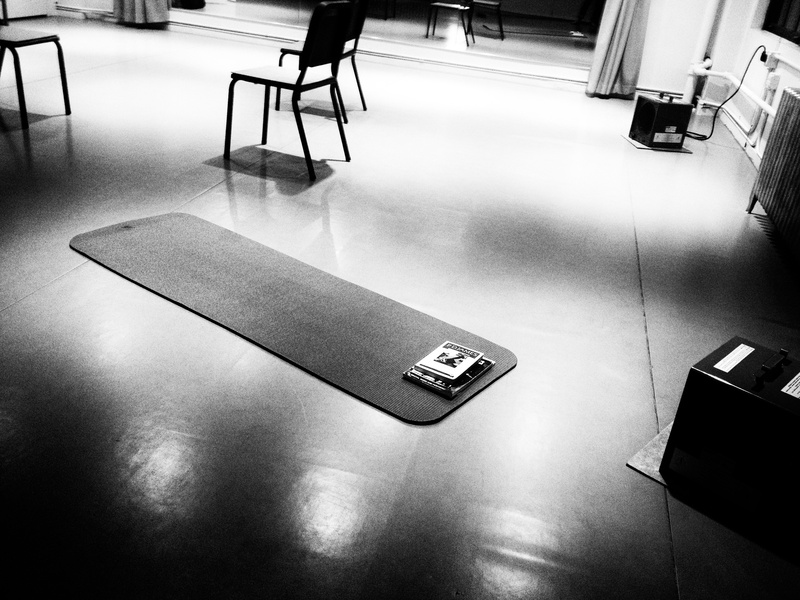 Our week long break is over…I am now ensconced back in my Alexander Technique teacher training. Three months have gone by since we have started. I guess I have finished the equivalent of two semesters of training. Rumor has it that I am progressing along quite nicely! I am thrilled that my sensory appreciation is improving. This new awareness feels great! In the hands on part of the class…well…we are putting hands on and following a person going up from and down into a chair. The emphasis is, at this time, of course, on our own use of self, but have to say, that it feels kind of neat to be at least following a real body. We are a tiny group, and in fact, the other day it so happened that I had the luxury of a class all by myself! So…hands on back of chair, hands on table, hands on two sides of a door. Then…hands on Tom, my trainer, as he moves around in the chair and gets up from the chair and goes down into the chair. Lots of times. I have one hand on his chest; one hand on his upper back. I follow him. Over and over again. It’s so intense. He talks me through all this…he prompts me with suggestions on how to direct. I over-concentrate and so I grip. He suggests that I concentrate less hard. Things improve. It’s difficult for me to free up my arms, elbows, legs, when he prompts me to, so I think about my primary control, and this undoes the gripping. I think to lengthen and widen my spine…at his prompting. I try to connect my hands to my feet. I try to undo the rest of me. My hands placed on him talk to each other through him, and this contact reminds me to lengthen and widen. I should not pull him down as he gets up and down from the chair. And I should not let my hands slip. He demonstrated on me what pulling-down hands feel like, and what hands-pulling-him-over-to-me feel like. He tells me to soften my hands when I am pulling him down. Presto! No pulling him down! We are now doing lots of breathing activities. I lie on the table, or sit in a chair, or stand up, and the others put hands on my abdomen to feel the differences among: normal breathing, exhaling on a silent “l” sound, exhaling on an “f” sound, exhaling while counting one to ten over and over–breath permitting–without pushing, exhaling with whispered ah. Then I put hands on while another does the same breathing examples. As a flutist, I am kind of obsessed with various ways to exhale while voicing various sounds. I regularly tongue using the labiodental fricative “f” sound for example. And a “la” or a French “lu” sound or a tu ru combination… So the Alexander Technique and flute technique are colliding right now to my infinite pleasure and amusement. Keith, my flute guru says “flute playing IS Alexander Technique!” Love this! Translation: good use of self sure helps to play well! I have been noticing for awhile that sometimes I hold in between an inhalation and an exhalation. Not good. The other way around, a pause after an exhalation, while playing flute, is actually helpful for playing. 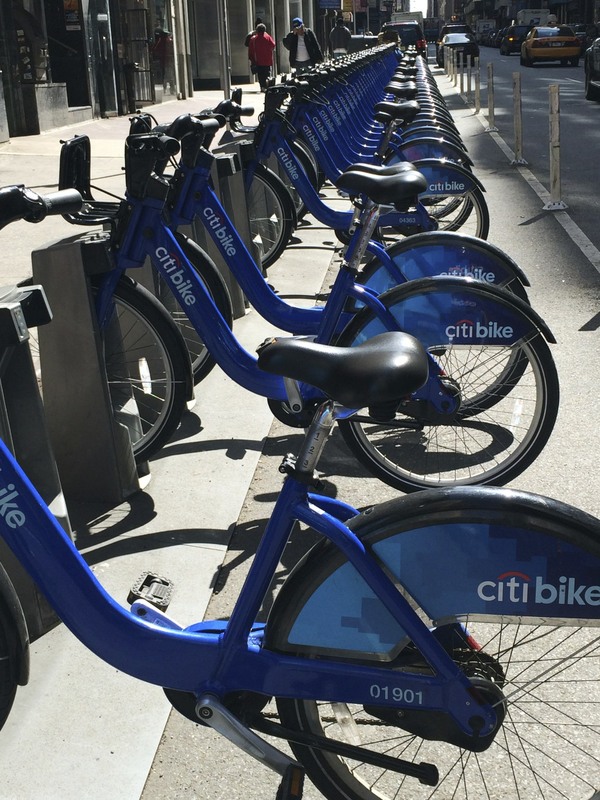 After the class for one, while I was walking to the subway, I noticed, to my surprise, a rack of citi bikes right there on 38th Street! Imagine that! I did a double take! Winter…see you later! Time to think about taking my bike off its trainer! Look at this! Bikes on 38th and Eighth! Posted 4:23 pm by Rena Anya Devéza & filed under Uncategorized. We now have a week off in training. I guess it’s supposed to be a spring break. Ha! 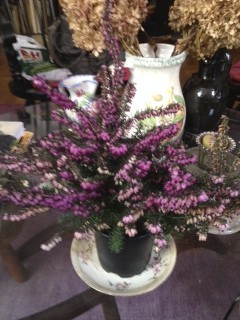 No sign of spring here in NYC yet except, maybe, for a pot of lovely purple heather that I purchased for my apartment. In fact, there is rumor of another snow storm coming our way soon. Can you believe it? Well, anyway…I have a pause from “guided” getting in and out of a chair, monkey, hands on back of chair, etcetera. I guess it’s a good time as any to reflect on what’s been going on with me. 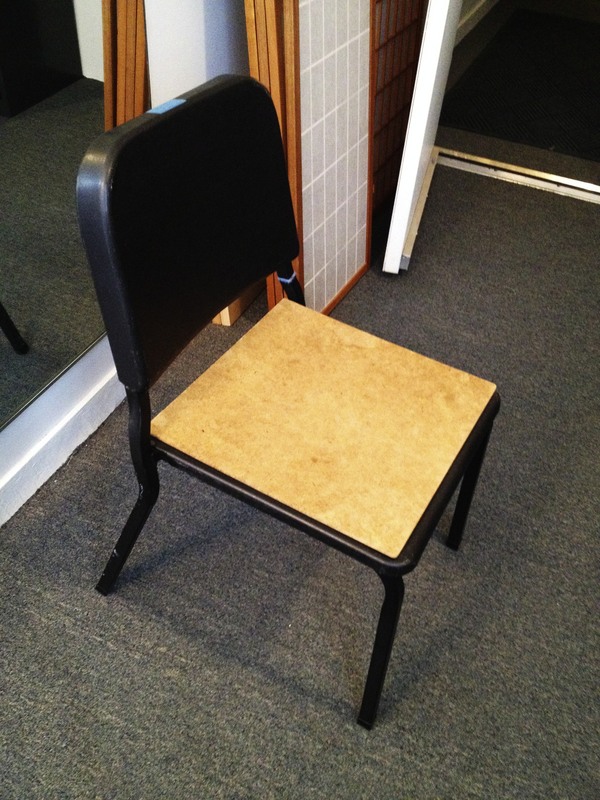 Below is a photo of the chair I use in training. The blue tape signifies that it is a short chair…so…this is my chair. I have been noticing that I have been pulling down, especially when getting up from this chair. I do tend to grip as a balancing mechanism. I suppose it is a good thing that I am noticing this stuff as I never have before. Blue tape on chair signifies that it is a short chair! My trainer has taken to guiding me in and out of the chair very, very slowly. Breaking it down, as it were. This helps a lot! I think it translates into me coming down less when I go into monkey, as well as, of course, getting up from the chair. In the last “hands on” before our break, my self-organization seemed to have improved a bit. I think “spine going up and back lengthening,” “head balancing…” I especially think of the front of my thoracic spine lengthening. My cervical spine is all fused and therefore cannot lengthen much. I feel that my cervical spine is the “achilles heel” part of my spine. So I must work around it, so to speak. In the week before our break, we have worked on breathing…regular breathing, exhaling on a silent la la la, and breathing out doing whispered ahs. Very fascinating stuff. I get dizzy doing this, as it extends my breathing and I am not used to the different levels of oxygen and carbon dioxide inside of me provoked by this extension. Anyway, I do a whispered ah while smiling a bit…kind of like the “stifled smile” I use for my flute embouchure. We have finished reading FM’s The Use of the Self, and the Bedford Physical Training College Lecture. We are now starting to read, in tandem, Constructive Conscious Control of the Individual, and Walter Carrington‘s Personally Speaking, which I am finding to be a page turner. During this upcoming week off I must try to get in lots of reading. Lately, we have been watching a DVD of Walter Carrington teaching. I realized when watching him do a whispered ah, that his mouth was way more open than my own when doing so. I need to think of an Italian ah sound. Walter’s explanations were so precise and clear! I must see all of this DVD! Check out Walter’s definition of the Alexander Technique here. I think that this week-long pause in training will provide a welcomed and refreshing break. I’ll be able to re-set. Onward and upward! Posted 4:05 pm by Rena Anya Devéza & filed under Alexander Technique, Alexander Technique Teacher Training. “Every reader, as he reads, is actually the reader of himself. The writer’s work is only a kind of optical instrument he provides the reader so he can discern what he might never have seen in himself without this book. The reader’s recognition in himself of what the book says is the proof of the book’s truth.” So wrote Marcel Proust. Leaving monkey aside for the moment…changing the subject for now…to change of the entire psycho-physical self…and memory. Also, as I progress in Alexander Technique teacher training, the more I am being revisited by old memories. Thus the core of myself is re-emerging…but in a different light. Childhood memories are re-appearing into my consciousness with the speed of lightening. My very first important memories are flooding back. Like, when I was so proud of myself for throwing that egg I was supposed to eat behind the washing machine…I was three at the time. I’m feeling again the glee of coming up with that solution for getting rid of the egg. I am so happy to be remembering that triumph of deception! I find that I’m in über Ukrainian Russian Jewish mode. I feel like I am communing with past generations of my family. I have been needing to cook myself the Russian food that I grew up on. I wish I could blab away with impunity in Russian and Yiddish! It hits me that I really would like to have my real name back…the one that was summarily changed and dumped at Ellis Island…too Russian…an American, pronounceable name was needed. How sad! All this happening makes me feel so in touch with myself. A validation of who I am. So…could my remembrances just be a coincidentally timed, or are they being set free by my going through Alexander Technique teacher training? Am I experiencing a re-reading of myself? Is there some kind of cause and effect here? Is the Alexander Technique proustienne in this way? It seems to me that it is the book tool par excellence with which to read oneself. Here I am, in an imperfect, cropped photo, obscured a bit, but I am laughing so hard…that I love it! Posted 5:27 pm by Rena Anya Devéza & filed under Alexander Technique, Alexander Technique Teacher Training. The combination of asthma plus bronchitis is not fun. And then when followed up by pleurisy well…sigh…breathing becomes really painful. But I am happy to report, that since I’ve been taking Alexander Technique lessons, and especially since I’ve been training to become an Alexander Technique teacher myself, my bouts of this stuff happening to me occur with less frequency and with less intensity. But, have to say, at the moment, I am so tired! 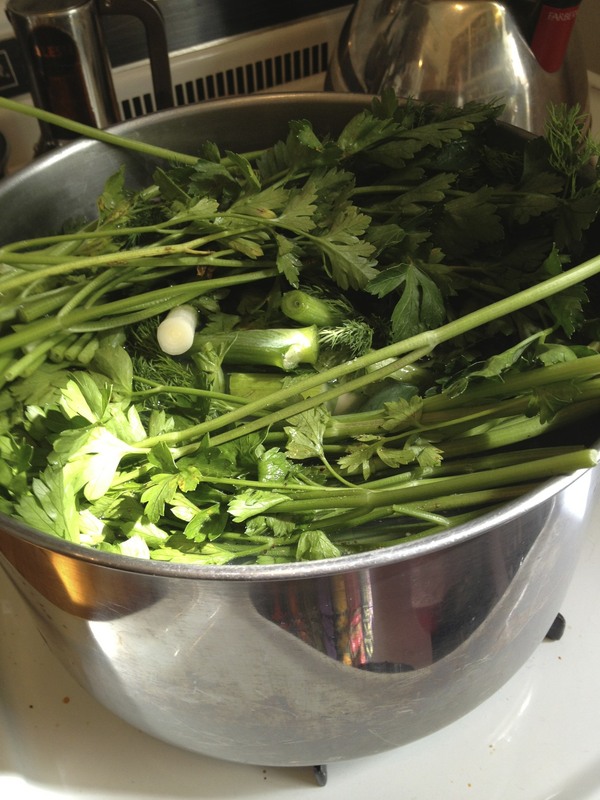 Wishing for my own homemade chicken soup (the best) but being way too wiped out to make any. After having been shut in for five days, I finally made it out, and the cold assaulted me. I was so fragile I could barely stand up. I felt that I was walking in slow motion. I had had to cancel every appointment I had scheduled. Freed up my calendar, so to speak, in order to stay in bed. Couldn’t go to work; couldn’t go to training. Couldn’t practice flute. I have to be pretty wiped out to miss work and Alexander Technique teacher training! That first sortie out was to a training class…I was not scheduled for work that day so I didn’t have to choose. I still cannot practice. I do have a ways to go before this thing is over. Oh that class was so wonderful!!! It was the usual scenario. It consisted of: a long turn…chair table chair, a directed activity, a discussion of the reading…the end of FM Alexander’s The Use of the Self, hands on: monkey with hands on table and then hands on real shoulders, a discussion of the Alexander Technique in general…this is ongoing… I cannot say that I was feeling refreshed, but, wow was it ever great to be in class again. It was luxurious. I was so grateful that I could breathe easier than I had been at the beginning of this illness…even if doing so with pain! I was so grateful that I could be there! I am realizing that my sensory perception has improved. I know right away if my spine is coming down instead of lengthening when getting up from a chair. I feel all too well when I am gripping in the legs. I am assured that I am doing these less than I used to. I do have a long way to go. I’ll just keep plugging away. The more I get into Alexander Teacher training, the more difficulty I have in describing succinctly what the Technique is. For me it is mystically life changing. Mystical because it is a mystery on how such a pragmatic thing can change every aspect of my being. I have to explore this thing that is changing my life in such an extraordinary way…to the max. I feel that I am very lucky right now. I am in the right place at the right time…in my native city, in this particular training course, at this particular moment in time! Posted 4:53 pm by Rena Anya Devéza & filed under Alexander Technique, Alexander Technique Teacher Training. I am feeling a certain kind of quiet descend upon me, enveloping me. My trainer said the other day that when he is using himself better the kinesthetic chatter goes away, and that he feels a certain quiet within. Love that! Maybe that’s what’s happening with me. But alas, I guess I have been run down lately. A persistent cough/cold thing turned suddenly into a nasty case of asthmatic bronchitis. Yuck. Why am I not surprised? It’s my go-to illness. What would FM Alexander say about this turn of events? That my use of self isn’t so hot? Sigh…I guess I’m stuck with another training hiatus…albeit a way shorter one this time around. Meanwhile…on the training front…before the asthmatic bronchitis hit…it was monkey. What else? Now we are putting hands on each other. So first monkey with hands on back of chair, then monkey with hands on table, then monkey with one hand on a shoulder, the other hand on a hip bone. Find that hip bone! 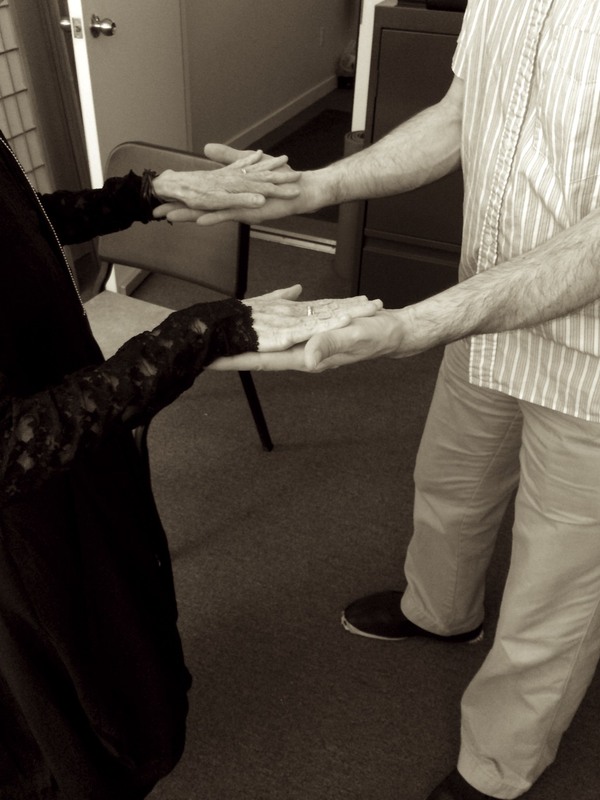 Of course I have put hands on before, in my first semester of training, and in lessons, but we are just starting to do this now in my present training course. So it’s been awhile. But now I am so much more aware of my use of self when doing so. The famous in NYC dollar a slice pizza joint on the way to TCAT-NYC. Not bad in a pinch! 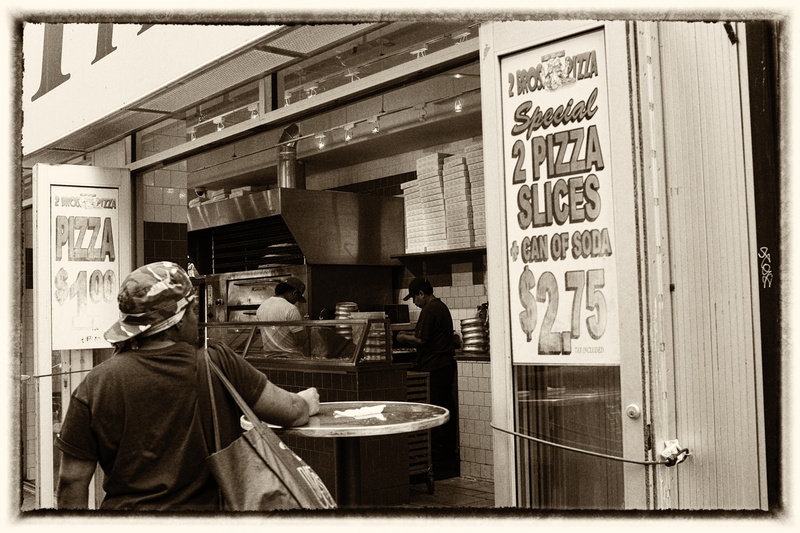 So, are you wondering, what the relevance of a photo of a pizza joint is to this blog post? Well I have no real answer. Except maybe that I was remembering that after the very first lesson I had with my teacher, who is now my trainer, I had a slice there. I had never gotten around to trying the place until that moment. A bit of historical perspective for you, dear reader. And, me personally, I do think that pizza is always relevant! Even now in this moment when all I want to eat is chicken soup! Posted 1:56 pm by Rena Anya Devéza & filed under Alexander Technique, Alexander Technique Teacher Training. I thought I would write up a bilan after a month worth’s of training. I can never remember the English translation for un bilan so I had to look it up: appraisal, assessment, results, balance sheet are some of the equivalent words. Emotionality…that is what’s happening. I’ve restarted Alexander Technique teacher training only a little over a month ago, and it feels so intense this time around. “Why?” I keep asking myself. Fourteen to fifteen hours of Alexander Technique per week. Okay. That’s a significant amount of time. And with this current training I feel that I am changing so rapidly both physically and mentally, I can hardly keep up with the changes. If I’m feeling physically so much better why am I feeling so out of control in the emotions department? Hmmm…because my body is being rearranged and body and mind are one? Because we hold our emotions in our physical selves as well as in our mental selves and rearrangement is going on in the entirety? Because I’m learning new ways of being…creating new habits? Because as I lengthen and widen my back and un-grip my shoulders is it that I’m becoming less and less defensive? I place the mat in front of the heater to insure that I have a toasty/comfy lie down! Well, whatever it is, it is certainly powerful stuff. I feel like I hardly know myself. My thoughts and my actions are foreign to me. I find that I have a funny dichotomy going on right now…I wish not to self-edit anymore and this throws me into a tizzy…and I am feeling a kind of soothing detachment from the bothersome stuff in life. “For me, a person’s unconscious is nothing other than his/her biography, a life story that, although stored in the body in its entirely, is accessible to our consciousness only in a highly fragmented form.” So writes Alice Miller in the preface to her book The Body Never Lies: The lingering Effects of Cruel Parenting. So is this why the long-buried memories from childhood are creeping back into my consciousness? Aha! My life is coming back to me as I’m undoing. Okay…I’ll take it back…even if “painful.” After all I am now a different version of myself. Trainer to student: “Think up when breathing in and out! We tend to come down when we exhale.” This makes a big impression on me. And sure enough he is oh so right! I pay attention to my breathing, and I successfully do not come down when I exhale. My breathing feels suddenly transformed; my shoulders seem to soften, to un-grip. I feel wonderful. This is the kind of self knowledge that I find pretty addicting. So, I will just have to go with the flow! Posted 10:07 am by Rena Anya Devéza & filed under Alexander Technique, Alexander Technique Teacher Training. Going into monkey with fluidity and elasticity, while keeping all my directions going, is challenging. It’s getting better but when will it be really organic with me??? “Oh! There is more movement happening throughout your ribs!” “Your breathing is different.” “Yes!!! That’s good Rena!! !” “Did you feel the difference?” And so we practice monkey over and over and over again in Alexander Technique teacher training. Je suis crevée, moi! I am wiped out! This stuff takes lots of mental and physical energy, yes it does! But I happen to be feeling really fine these days. I am more “up” than I used to be. Big smile here!